Keep your keys together and show your love of Bingo at the same time! 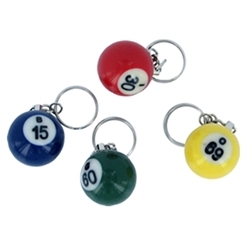 These are standard size key rings with a short and strong chain attaching a small Bingo ball to them. They have a little bit of weight to keep them from breaking and to help you not lose them.